If the person receiving treatment sweats alot on a daily basis - no marks may ever occur. People who live/work/play in toxic environments (or were exposed to a heavy dose of toxic material) may consistently mark. Sites where there is old trauma or injury may require multiple Cupping treatments to remove all stagnation. You will find in follow up treatments the marks will be progressively lighter as the pathogens are systemically removed from the body. Why would anyone trying to perform at their peak performance choose a therapy that did not help them do so? The chemicals used in the pools that these althletes train and compete in for many hours every day is highly toxic. Cupping draws these toxins out of the body which would otherwise lead to stagnation, blood poison, pain and disfunction. Many althletes rely on cupping on a regular basis to detoxify and enhance their performance. Picture of one of the Chinese Womens Weightlifting Team Members at the 2012 Olympics. By the way, these girls took 1st Place. Those unfamiliar to Cupping Therapy, believe the Cupping marks to be bruises. In North American society bruising is considered an injury. Bruising is caused by impact trauma with compressed breakage of capillaries and a reactionary rush of fluids to the damaged location from the tissue injury. There is no compression in correctly performed suction cup therapy. Although it is quite common during Stationary Dry Cupping (left static for 5 - 20 minutes - see below) to achieve dramatic 'marks' or 'discolorations', the less aggressive action of moving the cups, minimizes the intensity and duration of the discolorations. Often, when a condition exists within deeper structures where sufficient pathologic factors and stagnant fluids (toxins, blood and lymph) are dredged up during treatment, discoloration will appear on the epidermis. 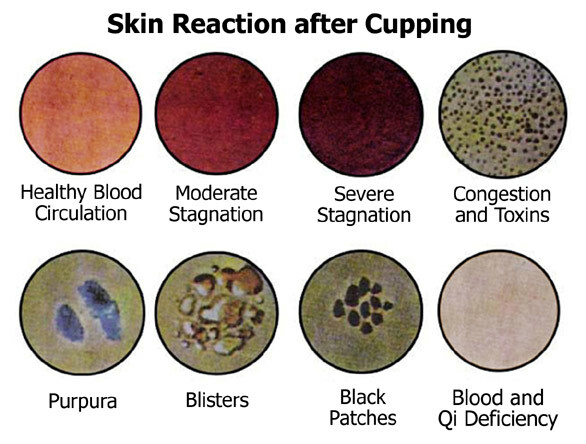 As treatments cumulate and the release of stagnation and buildup has been released, dispursed and drained – (sometimes quickly as the 2nd treatment) no discoloration is likely to occur at all - even though each time the cupping may have been focused on the same area, for the same duration, and with the same amount of suction. This action is the result of having internal unwanted toxins systemically purged. But, regardless of the obvious therapeutic value of drawing these agents out of the body, it is vitally important to educate your clients to the nature of the discoloration and self-care. Provide them a thorough understanding of the marks to assist them in relaying accurate information to others who might see it. If there is concern about leaving discolorations on clients, and/or the process of educating these clients (including a release form) is unwanted – then suction cup therapy is not for you. And, there are simply people who will not want such marks - no matter how potent the health benefits. And, being uneducated about the marks (like the "significant other", and yes, even other health practitioners), upon seeing it on the skin can perceive it as bruising and become very concerned. It is the responsibility of the Practitioner to carefully screen, educate and support their clients in this matter. Prior to any suction cup therapy, a release form should be signed for your records, and appropriate take home documentation provided to the client for their information. Suction pulls toxins, pathogenic factors, blood poison, dead lymph and cellular debris from deep within the tissues to the surface. These debilitating agents are then more easily expelled from the body. The deposits dissipate from a few hours up to several weeks, depending on the amount of stagnation and the patients post treatment activities. The quality of the pathogenic factors varies according to the severity of the patient's blood stasis -- which correlates with the nature, severity and type of condition they have. It can appear from a light pink to a dark purple, but is usually a shade of red. Often tiny raised bumps will appear. Sometimes a clear fluid will be drawn to the surface. needing to be purged from the body. Although the marks look painful, they are not. Patients usually feel an immediate sense of relief. 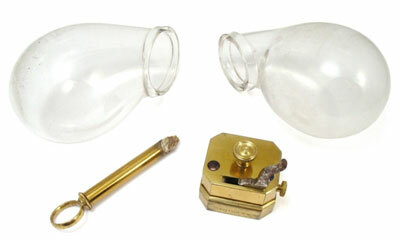 Here are some antique instruments used in Wet / Bleeding Cupping aka Hijamah. As you can see to the picture to the right - the glass cups are designed to contain the drained fluids as the cups are removed. 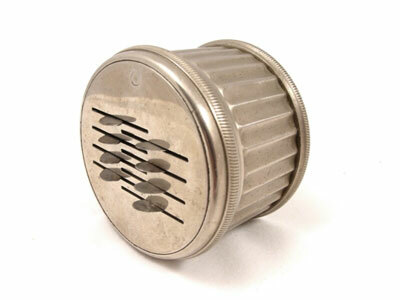 The picture below is one type of scarification tool historically used to score the skin for drainage aka Phlebotomy. In today's applications - Plum Blossom Needles are used as well as lancets and in some cultures - razor blades. In the US, this procedure falls outside the non phlebotomy licensed health professional. The above photos show Wet / Bleeding Cupping. This particular method of cupping is a specialty treatment and must be performed by trained and qualified Wet Cupping Therapists. This procedure falls within a limited scope of practice. Please know your legal limitations beforehand. 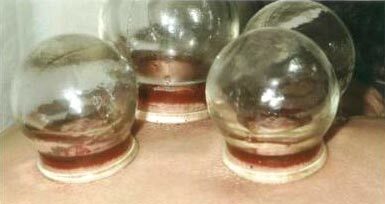 NOTICE - The preceeding information and photos are provided only to demonstrate the effects of retaining cupping protocols. These are not the effects normally seen with in massage, dynamic, aquatic or intermittent Cupping applications. 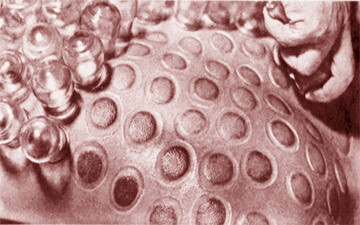 Cupping Pracititoners might only, in severe cases of toxicity and stagnation, induce such dramatic discolorations. © 2005-2010 ICTA - All content on this website is Copyright Protected.